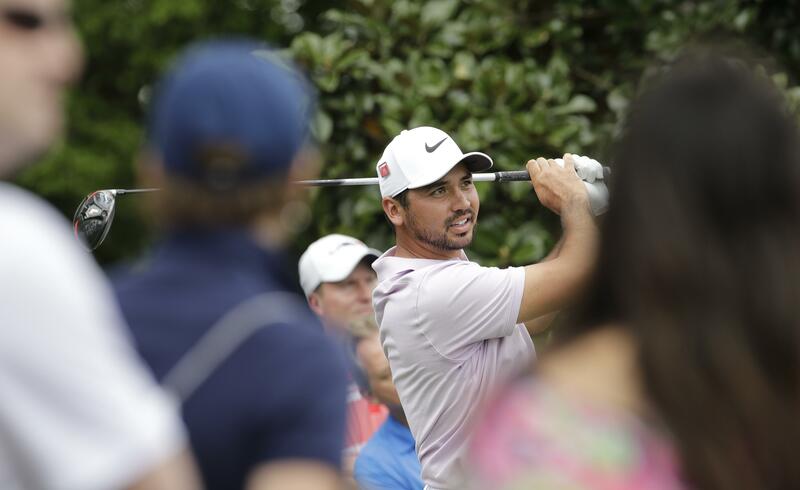 AUGUSTA, Ga. – Jason Day began the Masters by throwing his back out while leaning down to kiss his daughter on the practice green. Day, who has a history of being bothered by medical issues, did better than just sucking it up. He went out and shot a 5-under-par 67 to move into a tie for the second-round lead. Day birdied all the par-5s on Augusta National to get to 7 under going into the weekend. That followed a 2-under 70 the day before, when Day said he injured himself kissing his daughter just a few minutes before walking to the first tee. Day’s trainer followed him around the course in the opening round, giving him treatment at one point as he lay down on the second tee box. Day said he briefly considered pulling out of the tournament, but decided to play in hope his back would loosen up. Exercise and treatment helped enough that he was relatively pain-free in the second round, and Day took advantage. He was particularly effective on the reachable par-5s, making birdie on all four after birdieing three the day before. He does stretches and therapy for 20 to 30 minutes at night and the same in the morning. He blows into a balloon to, he said, move his rib cage into proper position. He deals with the negative fallout on social media when he leaves a golf tournament because of medical issues. At the age of 31 that’s happened nine times already, and that doesn’t include when he collapsed on the ninth green in the opening round of the U.S. Open in 2015 because of vertigo. Day, an Australian native who lives in the U.S., has won 12 times on the PGA Tour, including his lone major, the PGA Championship in 2015. He won twice last year, has played relatively well this year, with three top-10 finishes, and is ranked 14th in the world. If anything, Day said, he might want the green jacket too much. And, in a funny kind of way, his bad back might ease the pressure this week. Published: April 12, 2019, 4:17 p.m.